This sounds like a tasteless-but-funny flight of fancy at The Onion, but it’s apparently legit: The Belgian arm of UNICEF has produced an anti-war public-service message which shows the Smurf village being devastated by warplanes. This is fascinating, but I think it’s impossible to have a well-informed opinion on it without seeing the ad. I’m assuming I’m not the only cartoon nut who, upon reading of it, thought of Hugh Harman’s Peace on Earth. It’s also evocative of Ronald Searle’s disturbing and unforgettable drawing “The Fall of St. Trinian’s,” which showed his schoolgirl character in rebellion, with dead children and severed heads everywhere. Nick Park’s Wallace and Gromit, the stars of three charming, inventive, and well-crafted short films, are now the stars of a charming, inventive, and well-crafted feature. I saw it at an ASIFA screening last night and had an awfully good time–as, it seemed, did the entire audience. When I first heard of this project, I worried. Would the cheese-lover-and-dog comedy team’s schtick grow tiresome at feature length? The answer, it turns out, is no. Were-Rabbit may be, pretty much, a Wallace and Gromit cartoon that happens to be a lot longer, but that’s fine–the barrage of comic ideas never flags, and the film doesn’t feel padded. Without question, it’s the most enjoyable non-Pixar, non-Japanese animated feature I’ve seen since Lilo and Stitch. You were probably going to see it anyhow, but consider this my recommendation that you do so. As before, Gromit is the smartest character here (and the best actor, despite doing most of his acting with his doll-like eyeballs and furrowed brow), and the humans, including Wallace, are mostly lovable numbskulls. Sure, we care about them. Yes, we root for Wallace and Gromit and their humane rabbit-removal service. But though Aardman’s working in a form that’s longer, its characters aren’t getting deeper. 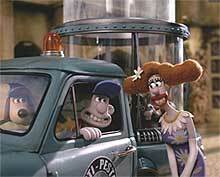 Wallace and Gromit make us laugh, repeatedly. Even after seeing Were-Rabbit, though, I can’t imagine them reaching deeper into our emotions, in the way that the major characters in the best Disney and Pixar features do. That’s partially because this movie is a silly (and occasionally slightly scary) horrific comedy. And it’s also because the Aardman style, as engaging as it is, is fundamentally non-serious–with their bulging eyeballs and double-wide mouths, the studio’s Don Martin-esque characters just aren’t built for anything but broad comedy. The film has moments which could have been taken seriously. Among other things, the plot involves a character who repeatedly threatens to shoot the rabbits who swipe vegetables from W&G’s clients. But this isn’t Bambi–you never fear for these bunnies’ safety any more than you do for Bugs’s. Even good computer animation sometimes feels sterile and synthetic, but stop-motion Aardman style is wonderfully, unapologetically hand-made. There’s nothing mathematical about these characters, who are truly cartoony in a way that computer-generated ones rarely are. If Gromit had been designed for computer animation, he’d have textured fur, claws, a moist nose, and an ornate collar–and he wouldn’t be nearly as engaging. Stop motion is a medium that’s often been burdened by cheesiness–yes, Rankin and Bass, I’m looking at you. Were-Rabbit reminds us that it’s capable of high comedy; there are countless moments in which the Aardman animators wring the maximum humor out of a moment through clever character animation. (One instance that comes to mind is when the hunter character accidentally dons a black rabbit instead of his toupee.) But even as I was laughing myself silly, I wondered: Is it possible to do truly great character animation in stop motion? Or, to put it another way, is there a Bill Tytla of clay? I’m not sure if there ever has been, but I think there could be. I think back to Will Vinton’s Adventures of Mark Twain film–and I get depressed, because that film showed that Vinton was on the verge of greatness before he turned his attention to singing raisins. Vinton’s melancholy Twain represents something close to truly great, multifacted character animation in a way that Aardman’s work, for all its lovable quirkiness, haven’t achieved. The Aardman crew is so obviously gifted that you instinctively expect great things from them. We all knew they could make wonderful short films. With Were-Rabbit (which I liked a lot more than Chicken Run), they’ve shown they can make a longer film that’s just as wonderful. But if their ambitions end here, I’ll be disappointed. I have no idea what’s next for Nick Park, but I hope that–like John Lasseter and Brad Bird–he challenges himself, and us, with films, themes, and characters that are as multidimensional as the medium he works in. Very, very sad news from my longtime friend Dave Mackey, proprietor of the indispensable DaveMackey.com. I was fortunate enough to be an usher at Nancy and Dave’s wedding in 1994. She was a wonderful lady who recently published important two books.